The shift solenoid valve DSL is turned "ON" and "OFF" by signals from the Engine Control Module (ECM) in order to control the hydraulic pressure operation, the lock-up relay valve, which then the controls operation of the lock-up clutch. Torque converter lock-up is controlled by the ECM based on engine rpm, engine load, engine temperature, vehicle speed, transmission temperature, and shift range selection. The ECM determines the lock-up status of the torque converter by comparing the engine rpm (NE) to the input turbine rpm (NT). The ECM calculates the actual transmission gear by comparing input turbine rpm (NT) to counter gear rpm (NC). When conditions are appropriate, the ECM requests "lock-up" by applying control voltage to shift solenoid DSL. When the DSL is opened, solenoid DSL applies pressure to the lock-up relay valve and locks the torque converter clutch. If the ECM detects an open or short in the DSL solenoid circuit, the ECM interprets this as a fault in the DSL solenoid or circuit. The ECM will turn on the MIL and store the DTC. Help us improve AutoCodes.com. Leave a comment below or tell us if the information above help you fix the code. 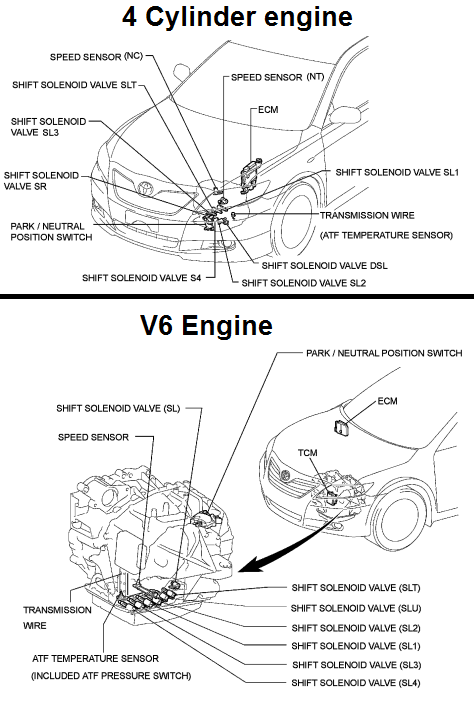 What are the symptoms on your vehicle for the P2769 2008 Toyota Camry code? Have you replaced any parts?